New York Governor Andrew Cuomo has vetoed a bill that was designed to transfer jurisdiction over criminal prosecutions stemming from events on Rikers Island from the Bronx to Queens. All you need to know is that the District Attorneys from both counties opposed the transfer, as did Mayor de Blasio and virtually every other organization (and most downstate politicos), with the notable exception of the Corrections Officers Benevolent Association. While COBA claimed the Queens DA would more aggressively prosecute inmates who assault guards, the union's rather obvious motivation was to get away from Bronx DA Robert Johnson, who's shown a willingness to go after corrupt or abusive guards. (As I have discussed here, here, and here). Cuomo's rejection was grounded on the notion that transferring a huge section of cases from one duly elected prosecutor to another would violate Article XIII, Section 13, of the New York Constitution, which permits voters to elect a district attorney to "faithfully prosecute" crimes occurring in their county of residence. (See here and here). 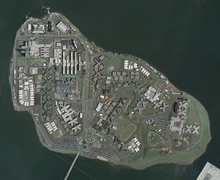 Rikers Island is a bit of a jurisdictional enigma. It is an island containing various jails, all of which are under the control of the New York City Department of Corrections. The island itself lies between Queens and the Bronx, the jails on the island all have Queens addresses, and the island is connected by bridge to Queens, not the Bronx. Yet, the island has long been considered to be part of the Bronx, and thus state court cases arising out of events on Rikers Island are heard in Bronx courts. Had the City initially determined that the island was part of Queens, it would be hard to argue. But the vetoed bill was plainly rank forum shopping, and it is precisely this sort of naked political gamesmanship that doomed the bill. Well, that, and the staunch opposition from prosecutors on both sides of the divide. While COBA's president has been complaining about the veto, it is probably not his membership's biggest problem. The federal government's announced interest in the management and oversight of the jail complex will likely pose far more problems for the City and the guards than any headaches that DA Johnson may cause. The short version: things are about to get worse for the people running Rikers Island, and that's good news.